Design and optimization of full decoupled micro/nano-positioning stage based on mathematical calculation Design and analysis of a full decoupled compliant positioning stage Zhigang Wu et al. Nano-positioning is widely used in Micro-electromechanical Systems (MEMS), micromanipulator and biomedicine, coupling errors and tiny output displacements are the main disadvantages of the one. 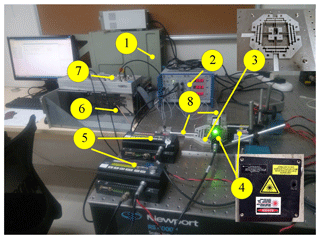 A totally uncoupled micro/nano-positioning stage with lever amplifiers is designed and tested in this paper. It is fully symmetrical along with the x- and y-directions. 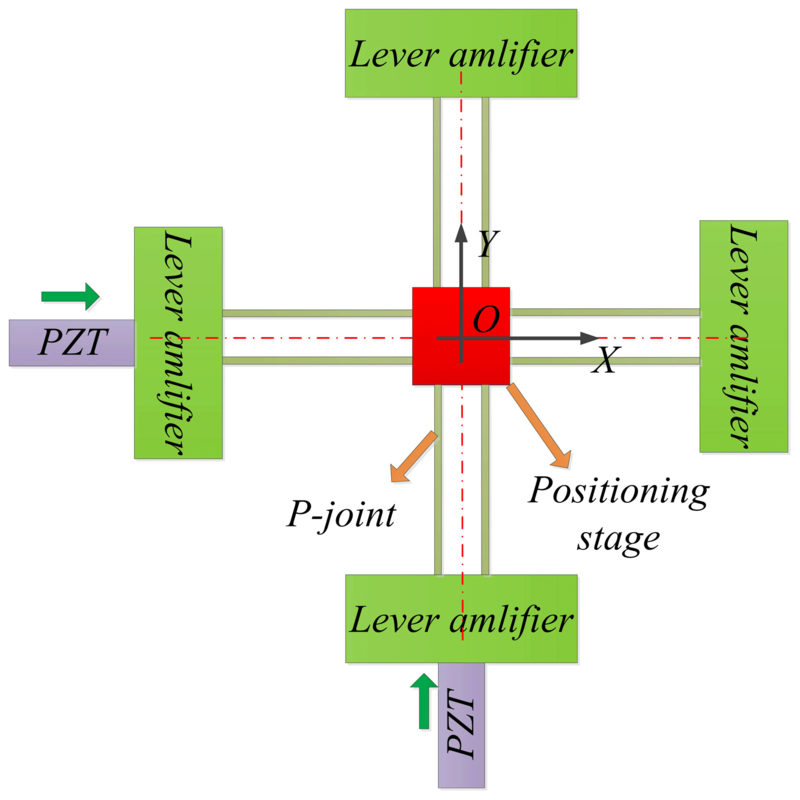 For obtaining large output displacements, two fully symmetric two-stage lever displacement amplifiers are utilized to amplify output displacements of piezoelectric actuators (PZTs). The established models for performances evaluation of the stage, in terms of kinetostatics, amplification ratio, reachable workspace, the input and output stiffness, are verified by finite element analysis (FEA). After that, the dimensional optimization is also carried out through the genetic optimization algorithm.The prototype of the mechanism is fabricated by using Wire-Electrical-Discharge-Machining (WEDM) process. Testing results indicate that the proposed micromanipulator demonstrates good performance. Wu, Z., Li, Y., and Hu, M.: Design and optimization of full decoupled micro/nano-positioning stage based on mathematical calculation, Mech. Sci., 9, 417-429, https://doi.org/10.5194/ms-9-417-2018, 2018. Flexible hinge, which possesses these advantages of no backlash, no friction, simple structure, and easy manufacture, is widely applied in the micromanipulation system including micro/nano-positioning stages, micromanipulators, and high-accuracy alignment instruments (Tian et al., 2009). Micromanipulation system has been paid more and more attention in recent years, especially the parallel compliant mechanisms own some inherent advantages as big load capacity, high velocity, and high precision compared with serial ones (Dong et al., 2016). Piezoelectric actuators (PZTs) are usually selected as the actuators of the compliant mechanisms due to these advantages of fast response and high precision (Yong et al., 2009). Unfortunately, small output displacements of the PZTs and cross coupling motions of the end-effector have badly restricted the further application (Yu et al., 2011) and development of the compliant mechanisms (Yu et al., 2015). At present, some amplifiers between the actuator and motion stage have also been proposed to overcome the disadvantage of small output displacement. Such as the lever displacement amplifiers (Tang and Li, 2015) and bridge-type amplifiers (Wu and Li, 2014) are commonly used as the bridge for amplifying the output displacements. Cross coupling of compliant mechanisms at x- and y-directions is an inevitable property in parallel mechanism (Dong et al., 2007). It can seriously influence the precision of motion (Hao et al., 2016). The 2-degree-of-freedom (2-DOF) compliant stages include two types of structure: One is in series and another is in parallel (Fan et al., 2018). For example, Lin and Lin (2012) have designed a series of xy compliant mechanisms with the maximal cross coupling error of 0.12 µm and the frequency of 50 Hz. Additionally, Polit and Dong (2011) have also proposed a high-bandwidth xy positioning stage with the cross coupling motion of 0.2 % at the total workspace of 15 µm × 15 µm in two directions. A kind of novel xy micromanipulation stage for micro/nano positioning and manipulation is also developed by Qin et al. (2013), which has the workspace of 8 µm × 8 µm with the first natural frequency of 665.4 Hz, while the cross-axis coupling error is 2 % more than previous results. In addition, Liu et al. (2015) have also designed a novel xy parallel compliant mechanism with the first natural frequency of 763.23 Hz more than other papers. 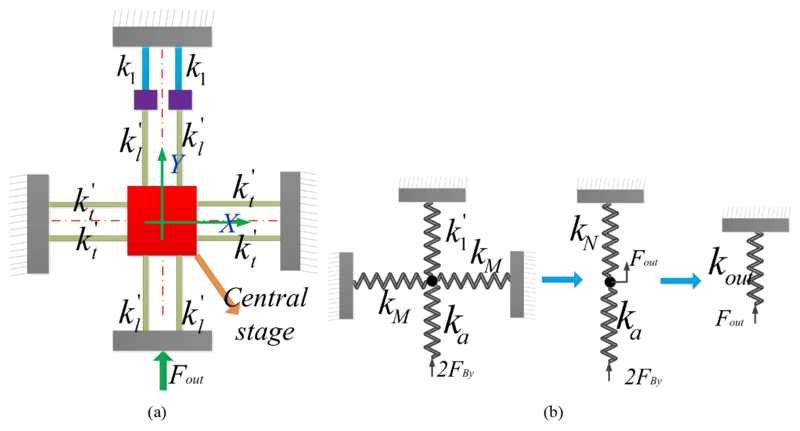 Based on the aforementioned analyses, the micromanipulation stage is proposed in this paper with low cross coupling, large reachable workspace, high stiffness and high bandwidth. It aims to improve the positioning precision of micromanipulator. The theoretical calculation, simulation analysis, and prototype tests demonstrate that the presented 2-DOF micromanipulator with mechanical amplifiers owns the performance for cross coupling error of under 0.1 % at the full range of 169.6 µm × 165.3 µm, with the frequency of 348.31 Hz, which can be used in high frequency positioning micromanipulation system. Additionally, the positioning system will be controlled easily by reducing the coupling errors, which have the important applying value in the field of micro-nano manufacturing platform or micro 3-D printing system combining with the micro gripper. The main contribution of this paper is described as follows: (a) the structural design, kinematics and statics modeling analysis, and prototype test of this novel mechanism; (b) the lower cross coupling errors with larger workspace compared with other papers. The remainder of this paper is organized as follows. 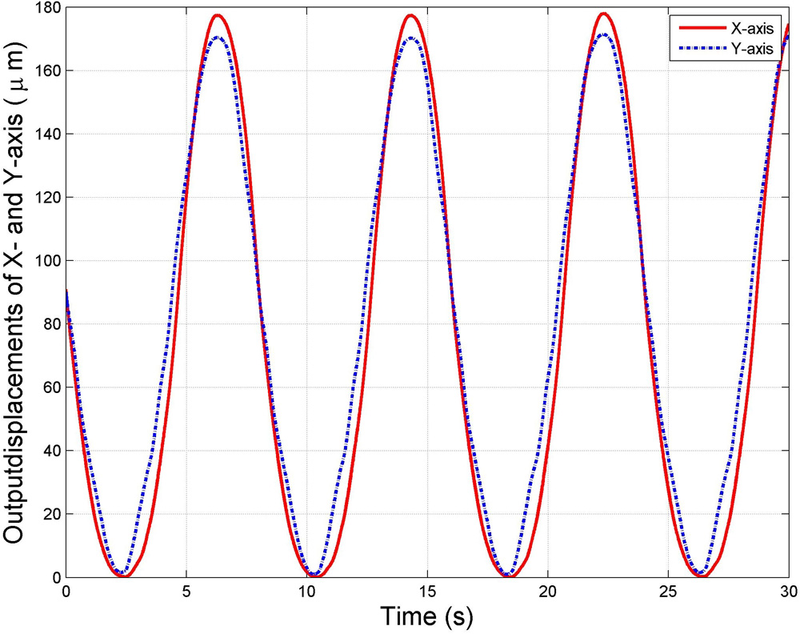 The concept of mechanical amplifier and the process of mechanism design is described in Sect. 2. Then in Sect. 3, the kinematics and dynamics analyses of the mechanism with amplification ratio, stiffness, reachable workspace and natural frequency are presented in details. Besides, the performance evaluation and model verification implemented by the finite element analysis (FEA) are conducted in Sect. 4. Afterwards, structure optimization is carried out through genetic optimization algorithm in Sect. 5. Furthermore, prototype fabrication and performance tests are presented in Sect. 6. Finally, the conclusions and future work are presented in Sect. 7. 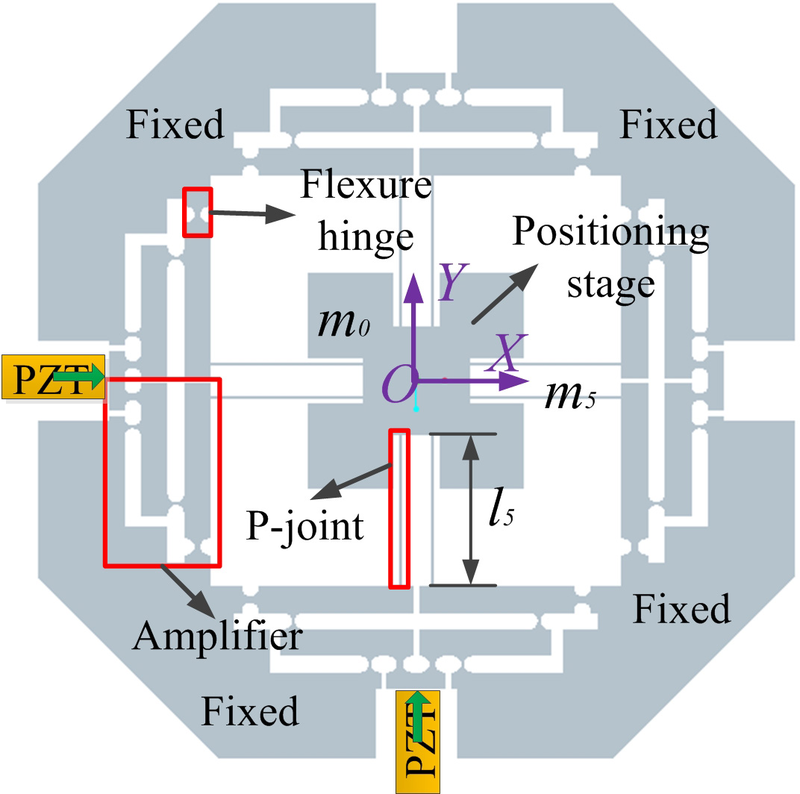 Lever amplifier based on flexure hinges possesses the advantages of high amplification ratio and simple structure (Choi et al., 2007). A two-stage amplifier is shown in Fig. 1. For enhancing the input stiffness, the parallel structure is used as an amplification mechanism for amplifying the input displacement as shown in Fig. 2. The mechanism is fully symmetric along with the central line and is connected by two amplifiers in parallel. The symmetrical structure of input-end of the mechanism can protect the PZT from damage. Figure 2Symmetrical structure with two 2-stage amplifiers. To eliminate cross coupling of the end-effector, symmetrical 1-DOF structure is shown in Fig. 3, where the double four-bar parallelogram mechanism is designed to connect the motion stage. The 4P-joint is composed of the four prismatic joints. Simplified principle diagram of the 2-DOF positioning stage is presented as shown in Fig. 4, where the four mechanical displacement amplifiers and two double four-bar parallelogram mechanisms are utilized to design a fully symmetrical mechanism along with x- and y-directions. Particularly, the vertical distribution structure of two double four-bar mechanisms can effectively decrease cross coupling. Figure 4Simplified principle diagram of mechanism. After a series of elaborated designs, three-dimension (3-D) model of the mechanism driven by PZT is proposed as shown in Fig. 5, input displacements of the motion platform, which are conducted by the PZTs installed in the x- and y-directions, can be magnified by the displacement amplifiers. Due to the symmetry of the structure and the four-bar parallelogram, parasitic motions of the positioning stage can be reduced or even eliminated. Circular hinges are adopted in the mechanical amplifier to avoid the parasitic motions. Figure 5The 3-D diagram of the 2-DOF compliant mechanism. There are many modeling methods to analyze the kinematic performance of compliant mechanism, such as the numerical model method, the pseudo-rigid-body (PRB) model method, and the compliance matrix model method (Tang and Li, 2013). In this section, kinetostatics and dynamics modeling of the compliant mechanism, including the amplification ratio (AR), input stiffness, reachable workspace and natural frequency, are analyzed by the numerical modeling method and Lagrange's method. where E is the elastic modulus, b is the thickness of the flexure hinge, r and t are radius and smallest thickness of the circular notched hinge, a and l are the width and length of the prismatic beam, respectively. Figure 6The flexure hinges: (a) the circular notched hinge; (b) the prismatic beam. where λAR and Kin are the amplification ratio and input stiffness of the micromanipulator, respectively. where kO2y and kBl are the lateral bending stiffness caused by force FO2y and output stiffness of the point B, respectively. kO2t and kBt are the rotational stiffness of the points O2 and B. 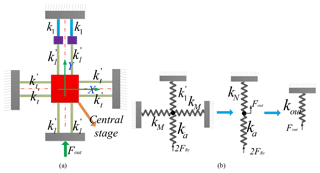 Figure 7Force diagram: (a) the deformation of the half of the amplifier; (b) forced diagram of beam 1; (c) Forced diagram of beam 2. For calculating the values of kin and λAR, the stiffness (kBl) of the output point B must be firstly computed. According to the Fig. 4, it can be observed that the output stiffness of the micromanipulator is the stiffness of components except from the driven amplifier. Simplified diagrams of output components are shown in Fig. 8 when the platform is driven in y-directions. The marked signs, kl′ and kt′, are axial stiffness and rotational stiffness of the prismatic beam, respectively. And k1 is the input stiffness of the two-stage amplifier when the input-end is at the point B and output-end is at the point A as shown in Fig. 7a. Figure 8The stiffness of output mechanism: (a) the diagram of the output mechanism; (b) the output stiffness transformation diagram. where M=1l42+29l22+125l12, kt′ and kl′ are rotational stiffness and axial stiffness of the prismatic beam. Combining the Eqs. (25) and (32), at the same time considering Eq. (2), total amplification ratio and input stiffness of the mechanism, which can be represented by the designed parameters including r, t, a, b and li(i=1,…,5), are not provided here due to page limitations. To conveniently calculate the corresponding calculations, geometric parameters and properties of the material (AL7075-T6) of mechanism are listed in Table 1. Table 1Geometric parameters (mm) and properties of material of the mechanism. where kc and f(β) are the dimensionless concentration factor and compliance factor, respectively. They are expressed by (Smith, 2000). where β=t/2r is the dimensionless geometry factor. Considering the amplification ratio of the mechanism, the output displacement of the stage can be 236.2 µm. 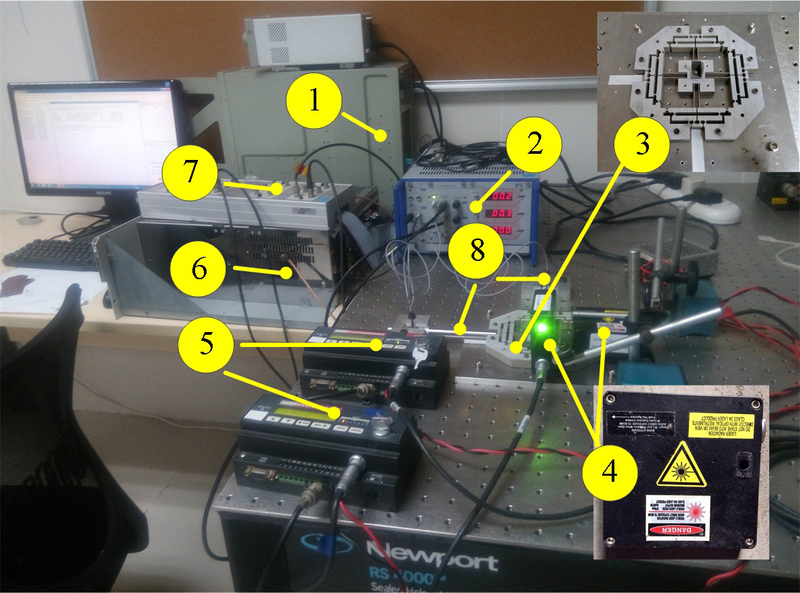 Due to the symmetry of the mechanism, so the reachable workspace of the platform can be expressed as 236.2 µm × 236.2 µm. Figure 9Deformations: (a) input at x direction and (b) input at y direction. where i=1,2, corresponds to the free vibration of x- and y-directions of the stage. where mi(i=0,1,…,5) are shown in the Figs. 2 and 5.
which has the unit of Hertz. In this section, the established models to evaluate the properties of the 2-DOF micromanipulation stage on aspects of amplification ratio, input stiffness, reachable workspace, and natural frequencies are verified by using FEA software (Li et al., 2012). For analyzing the amplification ratio of the proposed mechanism, an input displacement with 20 µm is separately provided in the x- and y-directions and the deformation of the mechanism is shown in Fig. 9a and b, respectively. Therefore, the corresponding output displacements can be measured by selecting the points of the surface of the central platform and the average values of them are calculated with 87.58 and 87.57 µm. 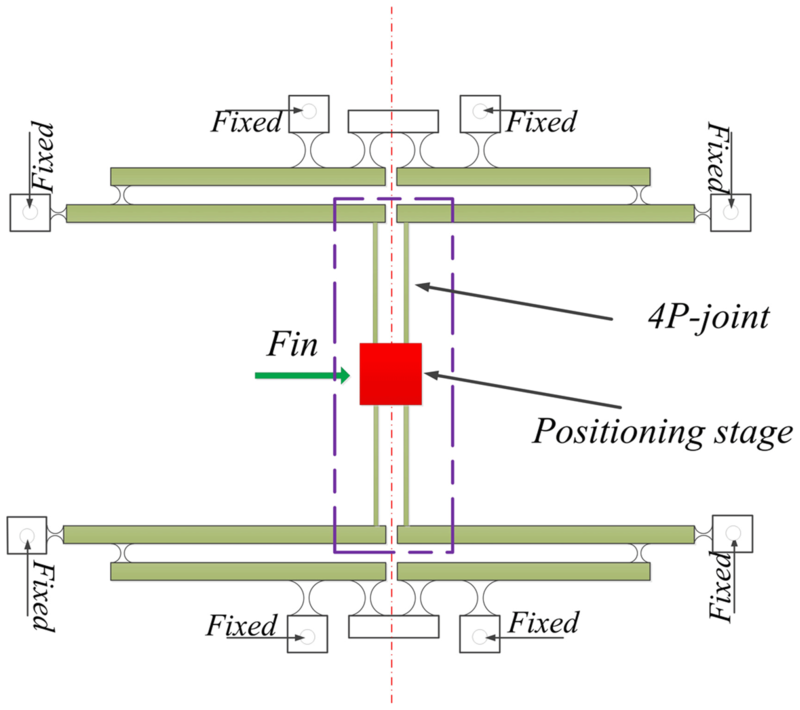 Additionally, the force can be also measured with 43.20 N. Therefore, the amplification ratio and input stiffness of the mechanism can be calculated as 4.38 and 2.16 N µm−1, respectively. Considering the workspace within the allowable maximum stress, the maximal input displacement of the Eq. (39) is simultaneously applied at the x- and y-directions. Thus, the maximal stress distribution and the corresponding displacement deformations are shown in Fig. 10. It can be seen that the maximal stress is 278.1 MPa at the point O3, which is less than the allowable stress of the material. The Fig. 10b, c and d indicate the maximal output displacements of the whole mechanism. Based on the aforementioned analysis, the reachable workspace of the mechanism is measured with 215.50 µm × 215.50 µm. Figure 10The stress distribution and deformation diagrams: (a) maximal stress; (b) total output displacement; (c) output displacement at x-direction; (d) output displacement at y-direction. In order to analyze parasitic motion of the mechanism, the maximal input displacement is separately applied to the x- and y-axes. As shown in Fig. 11a and b, which is the output displacement of x-direction with 215.50 µm and parasitic motion at y-direction with 0.034 µm, respectively. Similarly, the Fig. 11c and d are the output displacement at y-direction with 215.50 µm and parasitic motion of x-direction with 0.036 µm. The parasitic motions of the x- and y-directions may be caused by the model errors and the deformations of the prismatic joint. Figure 11Output displacements and parasitic motions: (a) output displacement at x-axis; (b) parasitic motion at y-direction; (c) output displacement at y-axis; (d) parasitic motion at x-direction. For verifying the dynamic model with the natural frequencies, the first four modal shapes of the structure are expressed in Fig. 12. The first modal shape is the rotational motion, which has the frequency with 179.99 Hz. The second and third modal shapes in the x- and y-directions are almost the same with values of 354.21 and 355.32 Hz, respectively. The fourth modal shape of the Z-direction is about 867.23 Hz. Figure 12The first four modal shapes of the mechanism: (a) the first modal shape; (b) the second modal shapes; (c) the third modal shape; (d) the fourth modal shape. Figure 13The verification of FEA: (a) deformation result; (b) stress distribution. Table 2Comparison results between calculated values and simulated values. For further indicating the rationality of the design (Li and Wu, 2016), a comparison between the calculated values and the simulated values of FEA, in terms of amplification ratio, input stiffness, natural frequency, and maximum output displacement, is listed in Table 2. It can be observed that the maximal error is the output displacement and amplification ratio by using the benchmark of FEA. The reasons may be that the transverse deformation caused by the transverse force as shown in Fig. 7 is not taken into account in the calculated models and flexure hinge itself. In addition, the maximal stress is under the truly calculated value. The natural frequencies of the x- and y-directions are almost equivalent, which demonstrate that their performances are identical. 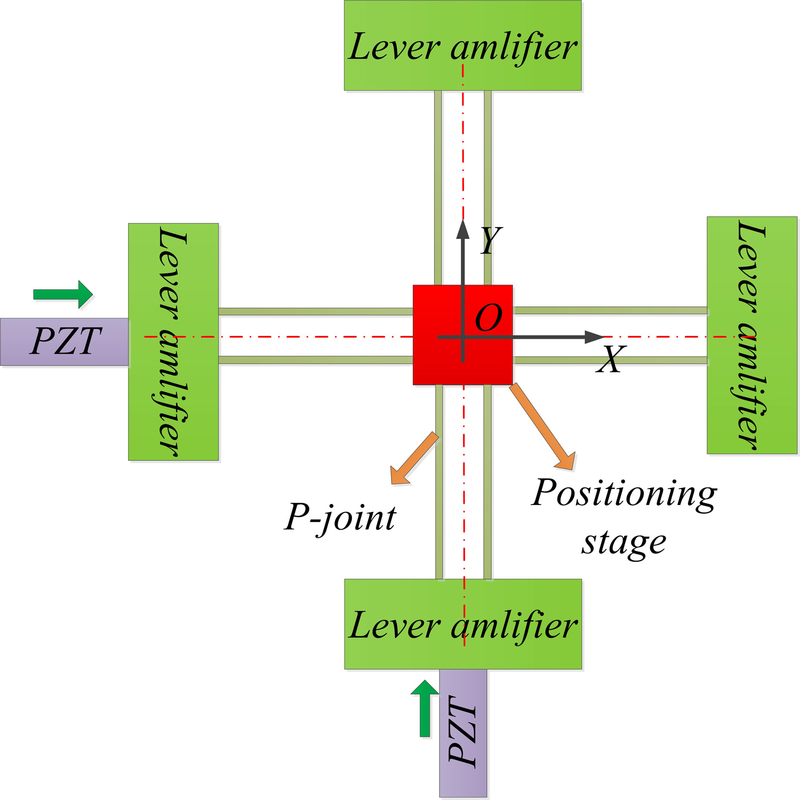 Cross coupling is the key performance of the 2-DOF micro-positioning stage. As shown in Fig. 11, the results of the maximum output displacements in two axes are listed in the Table 3. The output displacement of x-axis is 215.50 µm when input displacement is separately applied at x-direction, while the parasitic displacement of y-direction caused by x-direction is only 0.034 µm. Taking input displacement as the benchmark, coupling error of the y-axis is only for 0.1 %. Similarly, the parasitic motion of x-direction caused by y-direction is 0.036 µm with the output displacement is 215.50 µm at y-direction. Thus, coupling error on the x-axis is only for 0.1 % more than that of y-axis. Additionally, output displacements of x- and y-axes are up to 214.99 and 215.01 µm when the input displacements are simultaneously applied in the x- and y-directions. Based on the aforementioned analysis, the 2-DOF micromanipulation stage has low cross coupling and owns the best decoupling property. Table 3Cross coupling in two axes. The parameters of the architecture by using the Genetic Algorithm (GA) method are optimized to obtain the best kinematic characteristic of the xy stage (Wang et al., 2014). In practical applications, the actual amplification ratio of mechanical amplifier is less than the theoretical value, which is arisen from the combination of the deformation of hinge and lever arm bending. Additionally, considering analytical models overestimate the performance of the stage with deviations around 5 %–30 %, a compensation factor, ε=0.75, is used in the optimization process to rebuild the models. Based on aforementioned equations, which reveal that the performances of the 2-DOF micro-positioning stage rely on the relative parameters. All established models mainly include these parametric variables: r, t, a, b, l1, l2, l3, l4, l5, which influence the synthetical property of the stage. Variables to be optimized: r, t, a, l1, l2, l3, l4, and l5. 20 mm ≤ l4≤40 mm, 28 mm ≤ l5≤40 mm. Figure 14The experimental setup. (1) Host computer, (2) signal amplifier and controller, (3) compliant mechanism, (4) laser sensors, (5) laser collectors, (6) dSPACE controlling system, (7) DAQ board, (8) PZT actuators. The Genetic Algorithm (GA) is adopted in the current issue due to its superiority of fast convergence, fewer calculating time and higher robustness over other method such as simulated annealing algorithm (Mccall, 2005). The optimization process is implemented by the GA toolbox of the MATLAB software and the results of optimized parameters are: r=1.5 mm, t=0.78 mm, a=0.5 mm, l1=5.47 mm, l2=14.57 mm, l3=7.90 mm, l4=27.94 mm, l5=28 mm, which will lead to an xy stage with λAR=7.87, kin=13.39 N µm−1 and the natural frequency f=367.07 Hz. After optimization, simulation is carried out for demonstrating performances of the optimized micromanipulation stage. Maximum input displacements are applied at x- and y-axes and the total deflection and stress distribution of the mechanism are expressed in Fig. 13. It is observed that the output displacement of x-axis is 94.90 µm, and the corresponding input force is 214.63 N. Therefore, the optimized mechanism has an amplification ratio of 4.75 with an input stiffness of 10.63 N µm−1. In addition, maximal stress is 263.68 MPa, which is far less than the yield strength of the material. Furthermore, the first four natural frequencies are also analyzed and their values are 174.26, 348.31, 350.14 and 850.65 Hz, respectively. They are all less than the frequencies before optimizing and the frequencies of x- and y-directions are very close to the calculated values, which demonstrate that the structure optimization is effective. 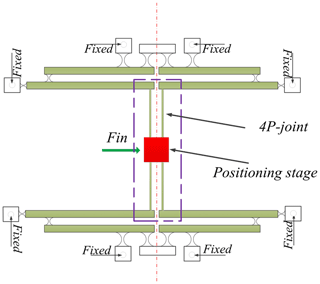 After fabricating, experimental setup of the micro-positioning stage is shown in Fig. 14. Two PZTs with stroke of 90 µm (model P-840.60 produced by Physik Instrumente, Inc.) are adopted to drive the micromanipulation stage, and the PZTs are actuated with a voltage of 0–100 V through a three-axis piezo-amplifier and driver (E-509 from the PI). Two laser displacement sensors and collectors (Microtrak II, head model: LTC-025-02, from MTI Instrument, Inc.) are used to measure the end-effector displacements of the two axes. The analog outputs of two sensors are connected to a PCI-based data acquisition (DAQ) board (PCI-6143 with 16-bit A/D convertors, from NI Corp.) through a shielded I/O connector block (SCB-68 from NI) with noise rejections. The digital outputs of the DAQ board are read by a host computer simultaneously. Figure 15The output displacements and parasitic motions: (a) the output displacement of x-axis and parasitic motion of y-axis; (b) the output displacement of y-axis and parasitic motion of x-axis. However, due to a considerable level of the noise, the resolution of the sensor is claimed ±0.2 µm by the manufacturer. In the process of practical precision motion control experiments, it is found that the limitation of the fabricated prototype mainly arises from the laser displacement sensors which have a not-high resolution of ±0.2 µm. To describe the dynamic properties of the proposed mechanism, the corresponding open-loop tests are carried out by using the dSPACE real-time simulation control system. As shown in Fig. 15a and b, which demonstrate respectively the output displacements and parasitic motions of x- and y-directions when the input voltage is u=30sin⁡(π4t-π2)+30. 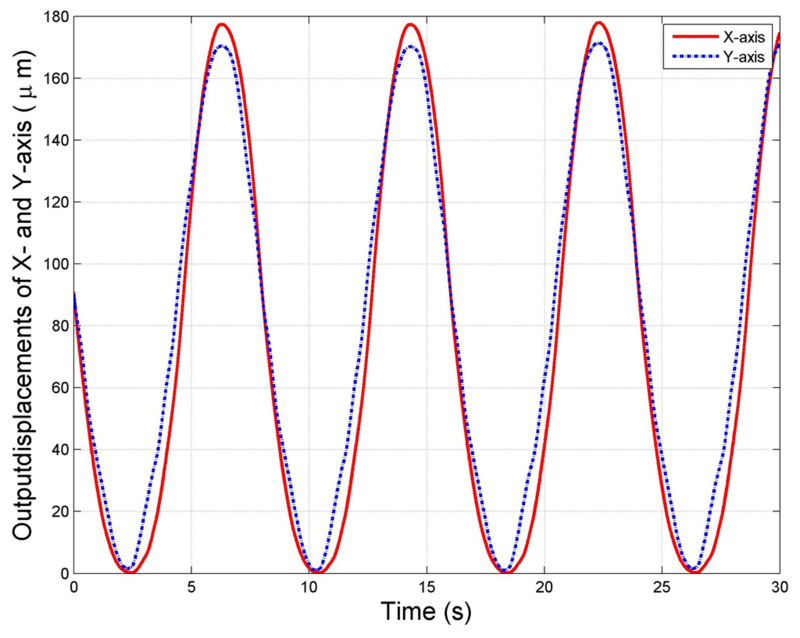 The results indicate that the actual amplification ratio of the mechanical amplifier in x-direction by comparing the input and output displacements is about 3.51 and the parasitic motion for the y-direction is about 0.32 µm. While one of y-direction is calculated as 3.43 and the parasitic motion for the x-direction is only 0.31 µm. Based on the aforementioned tests, the experimental results are less than the analytical results. The main reasons may come from the assembly errors of the system and the preloaded force of the PZT. Additionally, parasitic motions of the x- and y-axes are very small, which can be ignored. Therefore, testing results demonstrate that the designed mechanism has excellent decoupled performance. Figure 16The output displacements of x- and y-axes. To further illustrate the kinematic performance of the micro-positioning stage, the testing results of the x- and y-axes are shown in Fig. 16 when the two PZTs at x- and y-directions are driven simultaneously. The results indicate that the output displacements of x- and y-directions are not identical. The errors may be created by the preloaded force of PZTs and manufacturing defects between two axes. For further validating the performances of micro/nano-positioning platform, a robust tracking controller is used to obtain the well tracking effect. The reference input displacement is the signal with different frequencies since the hysteresis phenomenon of piezoelectric actuator is a rate-dependent hysteresis. Therefore, the robust controller can effectively eliminate the drawback caused by rate-dependent of the PZT-actuated micromanipulator. The tracking results and corresponding errors is shown in Fig. 17, where output displacement is well tracking with the input displacement and the error is low than 0.01 %. Thus the optimal design is suitable for this compliant mechanism. Table 4Property comparisons for proposed xy stages. Figure 17The tracking result and error: (a) the tracking result; (b) the tracking error. From the Figs. 15 and 16, we can see that the output displacements of the x- and y-axes are not exactly same, the main reasons maybe come from the errors coming from installation and manufacturing. Thus, the rotation of end-effector can exist, but it may be minor affections for the other orientation. Based on aforementioned modeling, analyzing, and testing, the results demonstrate that the proposed 2-DOF micro-positioning stage with mechanical amplifier owns some advantages, in terms of large motion, and low cross coupling. A comparison with other proposed 2-DOF stages are completed in Table 4. The natural frequencies of the presented stages in Ref. 3 and Ref. 11 are higher than other mechanisms, but their working ranges are very small, which seriously limit their further applications. Additionally, the performances in terms of cross coupling and workspace of the other two stages presented in Ref. 5, Ref. 9 and Ref. 12 are obviously lower than the proposed in this study. In this paper, a novel fully decoupled xy micro-positioning stage with lever amplifier has been proposed. The designing process of the stage is provided in consideration of the decoupled property of the output motions. In addition, the analytical method and Lagrange's method are adopted for the kinematics and dynamics modeling of the mechanism with amplification ratio, stiffness, reachable workspace and natural frequency. The modeling verification and performance evaluation are carried out by FEA. Considering the performance requirement, a series of structural optimizations by using GA method have been implemented to improve the amplification ratio. Finally, prototype fabrication and experimental tests are implemented in detail. All results indicate that the maximal cross coupling of the 2-DOF micro-positioning stage is less than 0.1 % under the workspace for 169.6 µm × 165.3 µm with the natural frequency of 348.31. For further study, intelligent controller is going to be considered to control the micro-positioning stage and precise position tracking will be carried out in our future work. This experimental data can be downloaded at https://pan.baidu.com/disk/home?errno=0&errmsg=Auth Login Sucess&&bduss=&ssnerror=0&traceid=#/all?path=/&vmode=list (last access: 20 November 2018). The main contribution for ZW includes the structural design, modeling analysis and the control. The contribution for co-author MH includes the structural optimization. And the contribution for co-author YL includes the structural design and the English writing error and grammar modification. This work was supported in part by Science and technology research project of department of education, Jiangxi, China (GJJ170568), National Natural Science Foundation of China (51575544, 51275353), Research Committee of The Hong Kong Polytechnic University (1-ZE97, G-YZ1G). This paper is done based on the research result for my research program. Testing results indicate that the maximal cross coupling of the 2-DOF micro-positioning stage is less than 0.1% under the full workspace with the natural frequency of 348.31Hz. The purpose of all work is to design a compliant mechanism for applying the micro-nano-positioning system. And that this work also extends my research interest in my PhD period.